These muffins combine the flavors of marzipan and poached pears. I cooked Bartlett pears with cinnamon, ginger, vanilla, and cloves, flavored the batter with almond extract, and added buttermilk for moisture and a hint of tanginess. 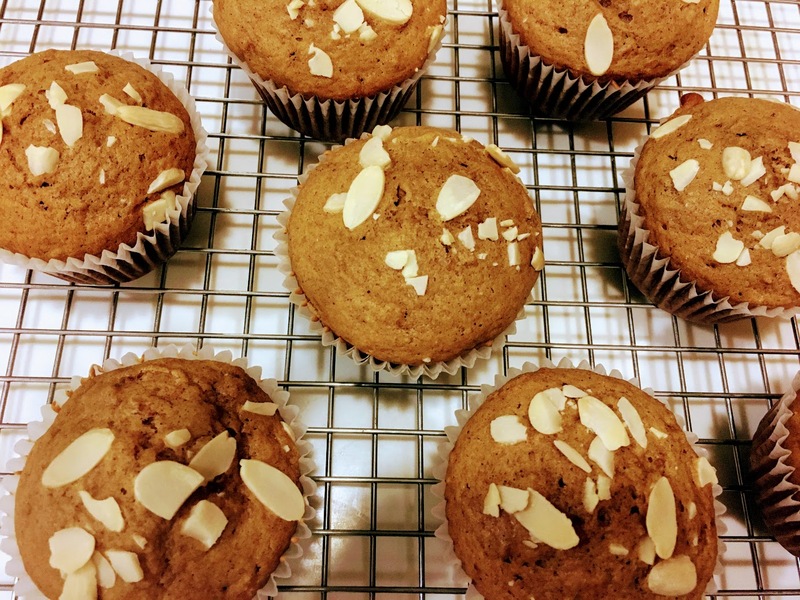 Almond slices sprinkled on top give the muffins a nice crunch. There’s a lot going on, but the flavors work well together and the texture is extremely light and airy. Enjoy these fresh out of the oven, or toasted the next day. Cook the pears: In a small saucepan, combine pears, water, cinnamon stick, ground cloves, ginger and vanilla. Cover and bring to a boil, then simmer over medium-low heat until tender, around 20 minutes. Remove cinnamon stick. Drain liquid, and mash pears with a fork (feel free to leave the pear mixture a bit chunky; this adds texture to the muffins.) Set aside to cool. Prepare the batter: In a small bowl, mix together flour, ginger, cinnamon, salt, baking soda, and brown sugar until thoroughly combined. In a large bowl, beat eggs. Stir in melted butter, buttermilk, and pear mixture until smooth. Stir in dry ingredients until just combined. Bake: Line a 12-cup muffin pan with cupcake liners. Pour batter nearly to the top of each cup. Sprinkle on sliced almonds. Bake at 350 °F for around 24 minutes, until muffins spring back when touched.